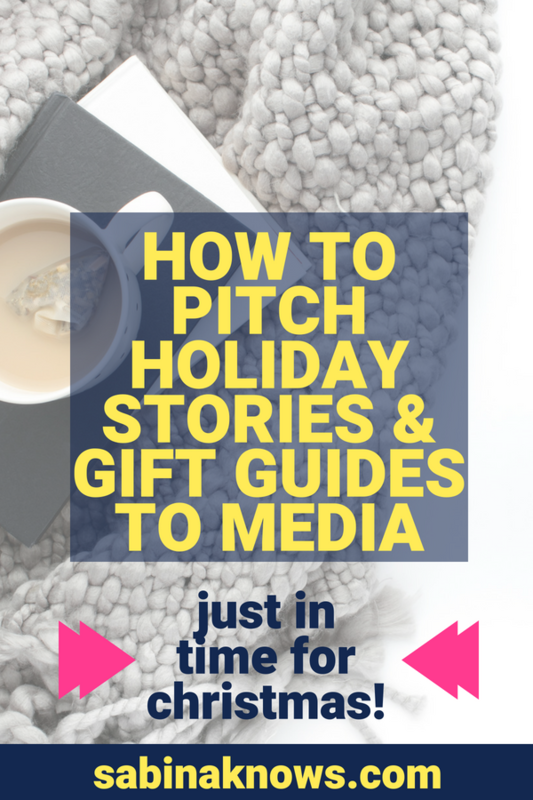 The Time to Pitch Holiday Stories & Gift Guides is NOW! Did you attend our FREE PR Training that covered holiday strategies for gift guides, expert tips, and seasonal business features? If you didn’t, you better watch our free video replay this weekend. You’ll find the video and the pitch scripts right below in this post! “That was literally the BEST webinar I’ve ever attended! Your personality is amazing. The value you provided was unbelievable…I’m so inspired and ready to implement! Do you want to feel like that? Do you want to get our step-by-step instructions to pitching the TV, online, and newspaper press (locally and nationally) for holiday stories AND score two pitch scripts you can use for your own outreach? We’ve made it easy for you because you can watch the free replay instantly, right below and download the accompanying companion guide and pitch scripts as well! How to Write a Gift Guide Pitch That Gets Opened: Not all pitches are created equal? Want to send a pitch that actually gets opened? During this video training, I’ll teach you how! How Can MY Pitch Stand Out: We’ll go through a checklist of do’s and don’ts that will help you be sure your pitch stands out from the thousands of other pitch emails the press are receiving! Hijack a Holiday: Did you know you can use the holiday and seasonal themes to create stories about your business that the local press will go crazy for? I’ll give you examples of how to do just that! Seasonal Expert Tips: What Works? Sharing holiday-inspired expert tips not only increases visibility, it validates your business and brand and can lead to long-term publicity opportunities. How do you create tips that get picked up? I break it down for you during class! What’s the Timing for Holiday Outreach? Folks, holiday gift guides are already being pitched! What’s the timing for product stories, tips, and seasonal business features? How can you “ride the holiday PR wave”? I explain it to you during our class. How to Pitch (Scripts for Products AND Experts): Sabina’s Simple & Successful Pitch Script Templates – Customize it and make it your own! **DOWNLOAD THESE RIGHT BELOW! Your Questions Answered LIVE: Chances are, if you have wondered something, others have too! During the class we did a lot of Q & A, and the replay includes it all! Holiday Pitching Companion Guide: Download HERE! Sample Product Pitch Script: Download HERE! Sample Expert Pitch Script: Download HERE! Do your PR skills need a little bit more TLC and support when it comes to hunting down media contacts who are the best to share your story with? Dive into this free training that will reveal how to find media contacts for free, and when you do you’ll also score a free PDF packed with email formulas and contact detail scoop you need to send holiday outreach emails and more! Check out the FREE Video Training on Finding Media Contact Details HERE! Do you want to get your hands on 35+ PR Story ideas the press will find irresistible? Download this FREE E-book and we’ll send them right to you, so you can create story ideas to share with the media and build buzz (and sales) for your business!